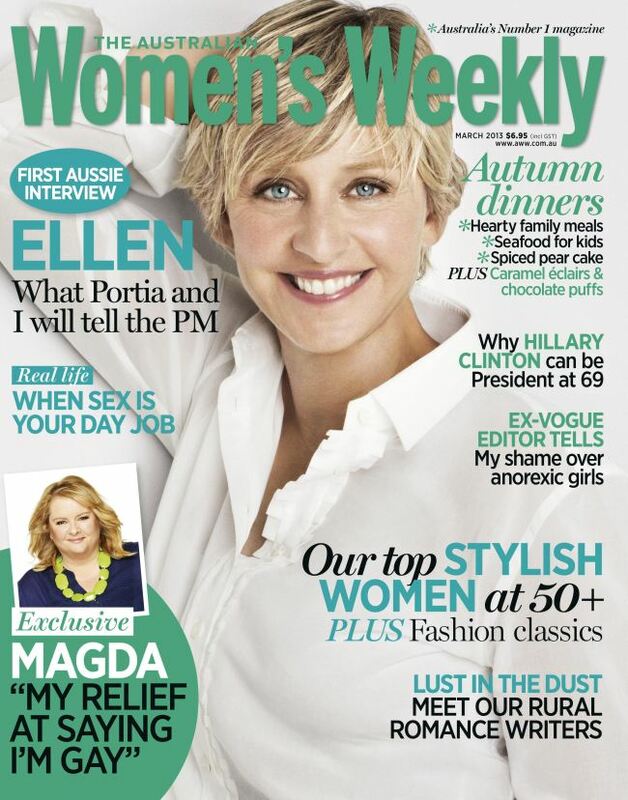 The excitement over the impending visit of Ellen DeGeneres to Australia is heating up and to celebrate, the Australian Women’s Weekly features Ellen as their March 2013 cover girl with an exclusive interview conducted by friend of Sam’s Caroline Overington. AWW: You’ve teamed up with Nicole Kidman for the promotion. Can you actually move in Hollywood for all the Australians living there: Hugh Jackman, Russell Crowe, Rebel Wilson, Naomi Watts and so on? Ellen: It’s actually very hard to move around Hollywood with all the Australians here. Not because it’s crowded or anything, but because they drive on the wrong side of the road. Ellen: Whenever we go ice-skating she spins in reverse. AWW: The dancing on your show — do you think people should just dance whether they are any good at it or not? Ellen: I think people should dance whether they’re really good at it or really bad at it. Because either way I’ll put them on TV. Ellen: Of course I don’t expect kangaroos in the main street. But I do expect to see them boxing. You can read more of Caroline’s interview at the AWW website here. So excited … not long to go!